Our attended laundromats have an outstanding reputation for being the cleanest, friendliest, and brightest laundromats Harrisburg has to offer. Our laundromats are attended 95% of the time, and our staff is available and eager to answer your questions. We provide ample seating and folding areas, and all locations have off-street parking for easy loading and unloading of your laundry. Our equipment includes eco-friendly washing machines that require less water and less detergent to decrease our impact on the environment. 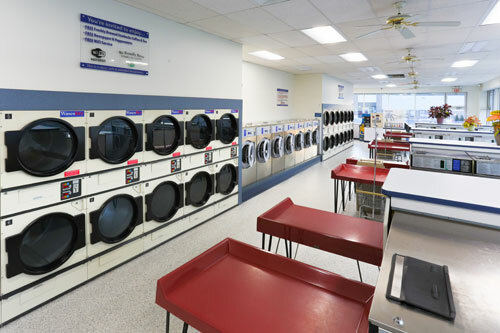 All laundromats have LED lighting which not only reduces utility usage but makes our locations bright and inviting. We are a coin-operated facility that uses quarters which means you don’t have to worry about purchasing cards, or having unspent monies remaining on laundry cards. We provide a no-fee bill change machine for our convenience. Since all of our locations are attended laundromats, you don’t have to worry about the hassles you may have experienced at other businesses. We are there to assist you and make your experience enjoyable. Since we are a self-service laundromats, you can wash your laundry at your own pace and without having to interact with the attendants. With five locations, we make it convenient for you to get clean! If you are unable to take time to go to the laundromat that is okay! We have a wash and fold laundry service that can be found at all of our nine locations. We also have pickup and delivery. Check to see if we’re in your neighborhood and let us help you with your dirty laundry. Contact us with any questions on our services.